When I married my Palestinian Muslim husband way back when, I accepted from the start that a pet dog would not be part of our future. I knew that dogs were considered unclean by most Muslims, and particularly by my husband. Even though I grew up having dogs as a child, I accepted this. Just another cultural compromise. I decided we would have cats. Of course, in Seattle, many people we knew had dogs. Every few years our children would beg for a dog of their own. Then we moved to Dubai. Living in this hot climate, in a Muslim country with my husband’s family regularly around, I knew that—more than ever—a dog was out of the question. Then our villa was burglarized. Twice. While we were sleeping. We experimented with window bars and locks. A raised fence and barbed wire were installed. Still, I didn’t feel safe. I began throwing around the idea of a dog. This was met with a cold stare from my husband. Out of the question. Months later, I received a shocking email from him: What do you think about this dog? Someone at work is looking for a home for him. Attached was a photo of a greasy-looking terrier. I told him I would love a dog, but not that dog. My kids and I got busy pouring over the pet page of The Gulf News. Within a week I was ready. Somehow the kids and I held our ground until the appointment the next day. K-9 Friends, a dog rescue center, requires that the entire family selects the dog. The volunteer explained to me that they didn’t want any dog returned because of a mismatch with a family member. So, we all trekked over to K-9 Friends, minus one, that is. “My husband couldn’t come,” I told them. “He’s travelling—out of the country.” I lied. All the dogs there had a similar look: a mixture of saluki, the tall, slim dog native to the Middle East and revered by many in the UAE. The dogs at K-9 Friends looked so much alike, it was as though they each had the same father, one feral dog who had impregnated all female dogs in Dubai. Still, we found one that was distinctive. Our chosen saluki mutt was golden in color and sweet in nature. More importantly, he had excellent dog manners due to his former owners, a South African family who had left the UAE. At home, we named the dog Jessie, and I quickly realized the outdoor thing was not going to work. Jessie barked too much. Plus, it was nearly summer and way too hot. We dabbled with the idea of an air-conditioned dog house and priced them at Ace Hardware—absurdly expensive. And so, Jessie became an indoor dog. He was allowed in one room only: the sunroom, a casual room off the back yard, a room which doubled as the TV room. Perfect! Word spread that we had a dog. Our Muslim friends and family stopped by to see the dog and give their opinion on the dog-in-the-house matter. I learned that some Muslims really don’t care. (Actually, there were few of these.) Most had very strong opinions. Some said that our house was contaminated. Several told me that angels would not enter our home if we had a dog in it. They emphasized the point that dogs were unclean. A few of my in-laws suggested that we were unclean as well. What I gathered from these discussions was that it’s the dog’s saliva that is considered unclean. Any Western expat who lives in the Middle East may already know this. If you are in the cinema watching a Hollywood movie, and a heart-warming scene appears, one with a dog licking someone’s face (or worse, their mouth), every Muslim in the audience will groan and turn away in disgust. Ever notice that? The standard Muslim practice seems to be: if you get dog saliva on your hand, you must wash your hand seven times. (In our house, this translates to “wash your hands really really well.”) Meanwhile, some Muslims—just to be on the safe side—extend this saliva taboo to the entire dog. They think if dog saliva is unclean, better treat the whole animal as unclean. To compound matters, many people in this part of the world have dog phobias. For them, their only dog encounters have been with stray dogs eating garbage by a dumpster. Or worse, they were bit or attacked by a dog. All of this meant that when we have Muslim guests over, we put the dog in the backyard for the duration of their visit. Sometimes a guest immediately clues into the dog in back yard. They know it’s our dog and right away they ask if we keep the dog in the house. “Just in one room,” I tell them. It’s not only the Muslims who are appalled. Some of our Western friends are shocked, too. They are dismayed that we restrict our poor dog to only one room. They are appalled that we leave the dog in there all alone and that we shout at him if he steps one paw out. Just when I thought I had figured out the Muslim/Arab attitude toward dogs, I witnessed something last week that surprised me. I was at the vet’s clinic, where I saw a severely injured medium-sized dog. He had been hit by a car, the Emirati woman in the waiting room explained. I expressed my sympathy for her dog. She told me that it wasn’t her dog. She had seen the dog get hit. When the driver didn’t stop, she did. Jessie …. What’s not to love? I love this story. Not because she saved the dog (well, that, too) but because it shattered a stereotype that I had held. I would never guess that an Emirati woman would get out of her car in her abaya and shayla, lift and carry an injured dog that wasn’t hers, put it in her car, and pay for its surgery. But she did. Back to Jessie. After several years, he has given me peace of mind in the home. But, no, he’s not exactly a member of our family. In fact, my husband still threatens to get rid of him. However, when no one’s looking, he talks to Jessie and gives him an affectionate pat. Do you have a cross-cultural dog experience to tell? Your pup is so cute. Very similar to the dogs that Hannah and I babysat last year. Such a funny story. In my family I was the one who had to be talked into getting a dog. Guess who worries the most about her now?! @Shirley Thanks for the comment, Shirley & the kind word. It’s great that you and your daughter have volunteered to help these dogs. There are so many dogs that need care around here. I loved your story. Hossein and I struggled too, about getting a dog but one day an “angel” dog appeared at the Catholic school where I was teaching. The nuns couldn’t keep her so I volunteered. She was a beautiful collie, the neighborhood kids called her Lassie, but I named her Esmeralda (Essie for short) after the gypsy in “The Hunchback of Notre Dame.” Hossein was working out of the country so Essie and became best buds pretty quickly. Then it was time for him to come home. He was usually exhausted the first day or two so I thought, “Great, his defenses will be down.” When we parked the car in the garage, we were going through the kitchen door, and there IT was: her bag of dog food on the dryer. With a movement similar to whiplash, Hossein asked, “What’s that?” About that time, I opened the kitchen door, and he found out. There she was, waiting, full of love and slobbery kisses for her new owner. He wasn’t impressed, but too tired to do much about it. We confined her to the den and there she would lay, her paws stretched into the living room, while her body stayed in her designated area. It was torture. Finally one day we decided to test her. Hossein pretended to attack me, and here she came, border or not, to save me. We all hugged, the den/living room no man’s land was quickly forgotten (at least by Essie and me!). Hossein and Essie became riding partners, he on his bike while she loped beside him, children calling “Lassie, Lassie” when they rode down the street. Skip to 2011, in Dubai, and we’re dogless for the moment but Hossein’s family came to visit and his sister Masumeh went on and on about her daughter Shideh’s dog in Australia! We saw pictures on FB and she said that her other daughter even sends special treats from Iran(?) to Australia for the dog! If this can happen, there can be peace on earth, one slobber at a time. I can relate to the dog issue as we have two and have had at least one since the kids were young. Did hubby and I have an issue? You bet. We lived in a town in Idaho and I picked up the stray at my work someone had dropped her off. My parents have had dogs since the beginning of time and I grew up with them. Hubby on the other hand hated dogs as he had been attacked by one when he was about 7. We have gone back and forth over the dog issue for years and have had a dog since then ending up with my mom’s dog when she could no longer care for it and now as I said we have two a whippet/lab mix and my son’s as they live with us called a Shiba Inu (Japanese dog). Of the two hubby likes the Shiba the best allows her upstairs, we even have a picture of the dog on the couch sitting next to hubby when the kids came from Arizona as she is not really a kids dog and she was seeking protection. He likes her as she is a very independent dog and is not the kind that has to be in your face. The lab mix loves attention. Both dogs stay downstairs and now are protective of our new grandson, the kids are living with us currently. The lab mix will station herself at the top of the stairs and will not let anyone go down she does not know unless someone from the family allows it, otherwise she will not allow it. He tolerates the dogs especially the lab mix as she is a guard dog and on more than one occasion she has alerted us to people at night that should not be around. It was funny when we went to Libya his brother had two dogs and hubby could not get over the fact but his kids love dogs and treat them well. Unfortunately during the conflict one of the dogs was killed but the smaller dog was adopted by another family is has a good home. Now as to the Muslim issue of dogs. The problem came back in the time of the prophet and there was an outbreak of rabies among the dogs (historical reference). The prophet stated that the saliva of the dog was unclean (from the issue of the rabies) and this is why it is necessary to wash anything 7 times. This just makes good common sense as dogs do pick up bacteria. Dogs are meant to be service animals and back then were not meant for pets. It is only in the last century or so that dogs have been bred and used as pets. Most cultures have used dogs as guard animals, herd animals etc. About helping the animals – it is very much recommended in Islam. According to one hadith or the tradition of the prophet Mohamed one man gave water to a thirsty dog with his shoe and God forgave his sins. There is many other hadiths about the importance of treating animals well. @Francine @Safiyyah Thank you so much for your comments & especially for sharing your dog stories!!! As wives, we’ve had to make a lot of adjustments. It’s only fair that our foreign-born husbands need to get used to a few new things as well. Dogs add such a nice layer to family life. Plus, they are protective & we all get exercise by walking him daily. In the end, I think these men enjoy the dogs, too, even if they can’t always admit it. Safiyyah, thanks for pointing out the issue with rabies. That explains a lot! @Nele Thank you for sharing this information. I have learned about this aspect of Islam, but I didn’t always see it in practice. It just makes common sense as a universal value to treat animals with kindness if we are able. Loved your story. You know that we are an animal family as much as I used to post about PK, Scruffy, Charlie, Sheba, Boy Dawg, etc. Mahmoud keeps telling me not to adopt every cat in the neighborhood (here or in Jordan), but I told him that they adopt me, not the other way around. I’m lucky in that Mahmoud loves animals and he loved Sheba (the German Shepherd) so much that she could do no wrong. She was spoiled by him. @Linda A Thanks for stopping by & sharing your experiences. I think whatever we give to animals we get back ten times. @Seattle Mama Salukis as part of a dog sled? Who knew?! Thanks for sharing this fact. The pure bred salukis are truly gorgeous animals. Hi Holly, Jessie is such a lovely doggy. i have one who looks exactly like Jessie but with a black nose. When me n my husband went to get a dog from Doggie’s Palace we found her. Her owner left her in the shelter for one weekend and never came back. She was left there for about two yrs. When i first saw her she was greasy and dirty but the way she came running to me like she knew me was something special. She was already 5yrs old so we didnt change her name. I had to presuade my husband for a week (with a dose of continuous tantrums) to get her home as he was not quite sure if he wanted or even liked dogs. However we got her after a week and its been 9 lovely months with her. We never had to train her as she is already trained and very well mannered. She never barks unless she feels threatened. As soon as my husband come back from work both of them get busy playing hide and seek for an hour or so. I hope your family with Jessie have a wonderful time together. I read all the stories it’s all heat touching and impressive but i noticed there is something missing.Yes ! @holly S.Warah tell to your husband there are some circumstances where you can raise a dog… 1. For Hunting 2. Security 3. & 4 i am not remember .. :p but there are some. if we can hunt with them how can we raise them without giving a tenderous touch. Actually i love animals, specially dogs attracted me a lot, but as i was young as like your husband my father is also most concern about the neighbors.there the problem arises we should be think that All the religions says to be love with animals so how a religion of peace and Harmony can refuce love dogs. Now i am in Dubai , my parents are in Srilanka but i told to my father when i came back home i will raise one boxer and one germen sheperd as my companian and i will change the mind of the societywith exact proof from the words… once i exactly get the “Quotes” i dont worry about the socity. (Truth is even most of the childrens love dogs their parents mislead them to hate instead of instruct them that is fine if you cleaning up your self after playing or touching with the dog…) isnt it ?? my friends. I hope your husband also will be accept jessie in-front of everyone without afraid of the society but the only concern about the almighty allah and the Prophet mohammed. Ohh dear I’m in the same situation. We want a dog, but my husband said a cat. I’m allergic to cats! Let see if I arrive to do something and have a dog. We were so blessed to have Polo, a loving, compassionate, peaceful, playful, intelligent Bernese Mountain Dog with us for 12 1/2 years. He was an angel in a fur coat…calming people in nursing homes and on the street, bringing out smiles and joy wherever he went. Just putting your hand on his head would bring peace to your heart. It was truly uncanny. Everyone would stop on the street to pet him, and many would gather and stay for awhile. He was known at all the parks. I took him to our Sufi gathering one night after the prayers, when people were having tea. I left him outside, where he looked forlorn. People saw him there and said bring him in, (to the social room, not the prayer area). No one in the group, from a variety of cultural backgrounds expressed any concern, just affection and delight. Insha’llah, dogs will be increasingly appreciated for their loving nature and their tremendous loyalty, intelligence and their varied service to humans as well. Polo became my mother’s care dog, he calmed and gave great joy as her Alzheimer’s progressed, and kept the rest of us sane and calm throughout the exhaustion of care-giving a parent with increasingly challenging symptoms. Just chanced upon your story. 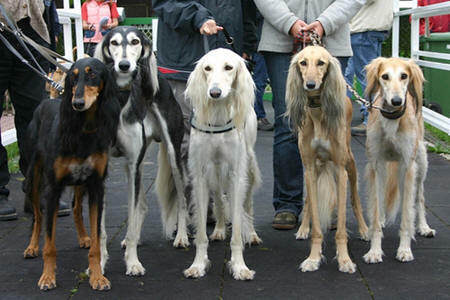 Your dog is more likely Canaan than Saluki. Canaans are the other forgotten dog of the middle east with a history of being in the region for thousands of years. A forgotten gem. Only recently recognized as a breed. These links may interest you. If you would like any more info feel free t contact me. Thank you so much for the info on this forgotten dog breed. I have never heard of the Canaan breed, but I will definitely check it out. BTW, as I mentioned in my post, all the dogs in this area have the same “look.” I see them everywhere–they look like cousins to my dog. I guess they are all descendants of the Canaan. Congratulations! Jessie is a very lucky desert dog! I am not in a position to adopt a dog but I foster dogs. I will be fostering my second desert dog next week. After all, a dog is a man’s best friend or in our case woman’s best friend. Hi Danielle, thanks for reading. That is wonderful that you foster dogs. We actually have fostered cats through feline friends (in Dubai) and we have so much fun with these animals. Pets can really add value to our lives. 🙂 Thanks for the comment. I just read your article again and I felt compelled to respond (again!). Hossein has a second-niece, Arghavan, (is there such a thing?) and her husband who received scholarships to travel from Iran and study in the US. One option was for a school in Texas that had the letters “A&M” after it! After we explained that our daughter Cynthia studied there and it is an excellent school, that’s the one they chose. They left their beloved dog Belphi back in Iran, but Arghavan’s mom (Hossein’s niece) has waited 7 months to get a visa to come to the US to visit. She’ll be in Texas in late January and I will get to meet another member of Hossein’s family. AND, she’s bringing Belphi! Dog lover that I am, I am so happy to see this custom of fearing/hating dogs, (ever so) slowly change in the eyes of Muslims. HI Francine, Thanks for this story. They are bringing the dog from Iran? Wow. That is love. 🙂 I hope the trip & the visit go smoothly. Take care. AS A SOUTH AFRICAN , I loved that you said she was trained in manners by A SOUTH AFRICAN FAMILY……..!! !yes now in SOUTH LONDON I never see manners anymore and I am shocked at the bad behaviour and lack of rules…. (so people don’t like me here-morals too high) but I stayed in DUBAI and my friend there had a great dog and we played in the desert BUT TH EMAN WAS SOUTH AFRICAN!!!! ha ha good story ….Dubai is too hot! Holly, perhaps you remember my sweet Daisy, the white boxer we brought with us to Dubai and managed to bring her back home 10 years later. Without Daisy in Dubai I would have withered away, she was my constant companion as we adjusted to life away from family and all that was good and familiar to us. In good weather she went everywhere with me, in the heat she only went when one of us stayed in the car with the air running. She had two good years here at home and then we lost her to heart disease the day after my Mother was buried. I really thought my heart would explode. I miss her so much I can’t stand it some days. It’s been since April and I still cry at the thoughts of her……like now. Daisy saw me through so many very lonely times and the last thing she did for me was after burying my Mother, as I sat and cried on Mom’s footstool, she came and laid her head in my lap, 6 hours later she wandered out to my Mom’s daffodil bed in the furthest corner of the back yard, she sat and sniffed the air in three directions, then laid down and did the same thing again, then laid on her side and she was gone. We were with her as we had a feeling something was wrong…..I will never forget it ever. Daisy was my best friend. We got Matilda near the end of Daisy’s time with us as we knew it was coming and we wanted to be able to transition more easily……well Matilda helped as she was a baby and needed a lot of care, but no dog ever could replace our sweet Daisy. Meanwhile Matilda learned from Daisy and is a great dog too, she will soon be a year old. Daisy loved on her as if she was her own puppy…..thankfully I took a lot of movies. Enjoy every moment with your pets, whether it is a dog, cat, goldfish or whatever it might be, enjoy and love them as they give you the most unconditional love you can possibly imagine. We moved from Kuwait to Dubai in 2003. After we got settled in, we learned that Dubai was more favorable towards owning dogs than in Kuwait. We were so excited to find out about K-9 Friends and adopted our Desert Dog! Our Lucy was 3-4 months old when we adopted her. They said she was found wandering in the desert. She will be 11 years old soon. We brought her and our cat, Ethel, that also is a rescue from Dubai back to the U.S. Our vet is very impressed in how healthy she is. She is still fit physically, but she is getting cataracts in her eyes. She has been the best family dog and very devoted. After loosing my Saudi desert dogs I have been obsessed with the need to get another. He has now joined me in Australia. He too was a K9 friends rescue from Dubai. Roxx spent 4 years in kennels overlooked by many. So glad they missed him he is a fantastic boy. For anyone on Facebook with a desert dog they are invited to record info and photos and share stories with others at https://www.facebook.com/groups/Canaandesertdogs/?fref=ts. Thanks, Duncan for the comment. I’m sorry to hear about your Saudi desert dog. I’m glad you got another. I will check out the FB group. Hi, i am that i saw a person visited this website and so i came to gain the pick out? . I am just searching for challenges to improve this site! Perhaps their ok to start using a handful of a person’s aspects!